Roya.com works with thousands of businesses nationwide to supercharge their online strategy with Canvas® powered websites and specialized digital marketing campaigns. The Roya.com team is driven by results, and we hold ourselves accountable for the growth and success of your digital strategies. Roya.com is a Software as a Service provider of digital marketing & content management platforms for small to mid-size businesses across the nation. 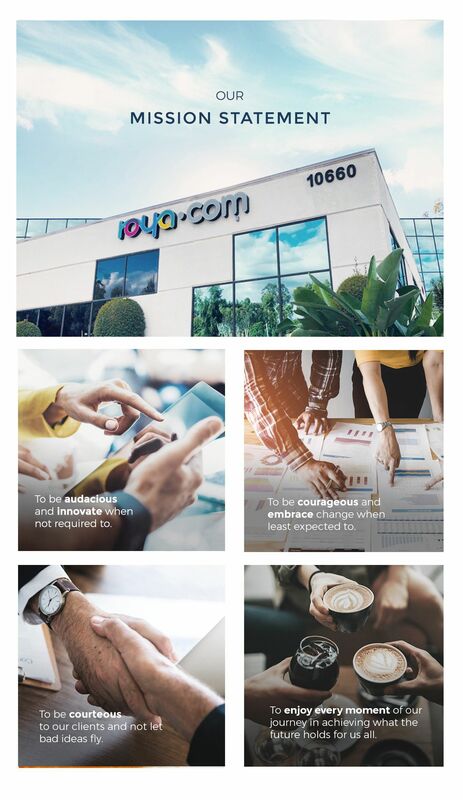 As one of the fastest growing companies in San Diego, CA, Roya.com has developed the proprietary Canvas® CMS platform with a wide range of built-in features to transform online marketing and bring cloud technologies to businesses of all sizes. Best-in-class technology promising constant innovation and continuous improvement. Deliver Results with complete transparency for clear ROI tracking. The Roya.com team, although diverse, shares a common passion for innovation, creativity, and collaboration. The Roya.com team is comprised of problem-solving individuals that celebrate the camaraderie and team atmosphere that powers the Roya.com company culture. As Roya.com continues to set the bar with best-in-class websites and marketing strategies powered by the Canvas® CMS platform, the team does not lose sight of its core values of delivering quality products and services to their clients. Angle RightA line styled icon from Orion Icon Library. Angle RightA line styled icon from Orion Icon Library.